Noooooooo! How did I not know this?! 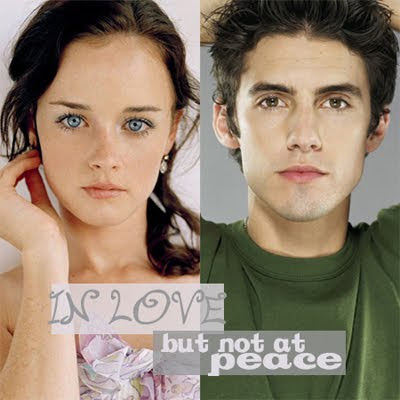 Were you aware that Milo Ventimiglia (Peter Petrelli from Heroes) was on Gilmore Girls from 2001 to 2006? I loved Gilmore Girls when it first premiered, yet life got in the way of the type of weekly devotion that was strictly reserved for Buffy the Vampire Slayer. You can therefore imagine my shock and awe at seeing a teeny-bopper Milo in Rory's arms. From what I've gathered from this episode, he's the bad boy of Stars Hollow. Very amusing! oh yes I loved/hated him as Jess he was ways getting sweet Rory in trouble hahah but then an again Dean was always my favorite! Yeah! That's the first time I'd ever seen him! I can't believe you don't remember this! He was Luke's bad boy nephew, Jess! I am always tickled when I revisit a older movie or show and see "famous" people in them. Too funny. I did know this! And he was oh so cute in it!! I looooved watching Gilmore Girls! !